A must-see country home, first time on the market! 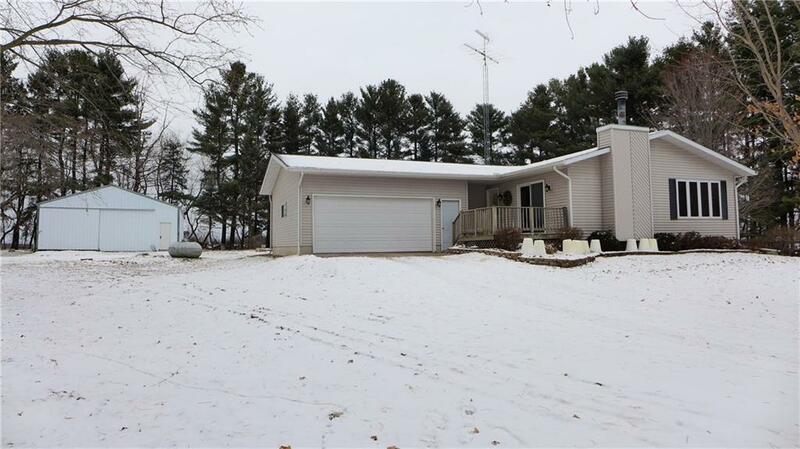 This newer, open-concept home is centrally located between Rice Lake, Barron and Cumberland for easy commutes and 4 miles from golfing or shopping. Just over 12 peaceful acres for a hobby farm and/or prime hunting on 8 wooded acres. The home offers newly installed stainless-steel kitchen appliances, spacious oak cabinets, a natural wood-burning fireplace, and wood deck with patio doors to view amazing sunsets. The lower-level has a walk-out patio beautifully landscaped from the finished basement, with added storage and a root cellar. It has a washer and dryer downstairs with first-level hook-up. Property includes a 2-1/2 car attached garage and detached 30’x45’ pole shed with concrete floor for extra storage and a workshop. Included are perennials with a large 56’x93’ fenced-in garden. Recent updates include a new well, new light fixtures, appliances, flooring, and paint throughout. This is one home you won’t want to miss!